Peoples Park Coral Bay is your ideal holiday destination in Coral Bay, Western Australia, located directly opposite the beautiful turquoise waters of Coral Bay & the World Heritage listed Ningaloo Reef. They cater for all budgets, offering premium accommodation ranging from our shady, lush green ocean front caravan and camping sites, to deluxe cabin accommodation, exclusive hilltop villas or ocean view penthouse. 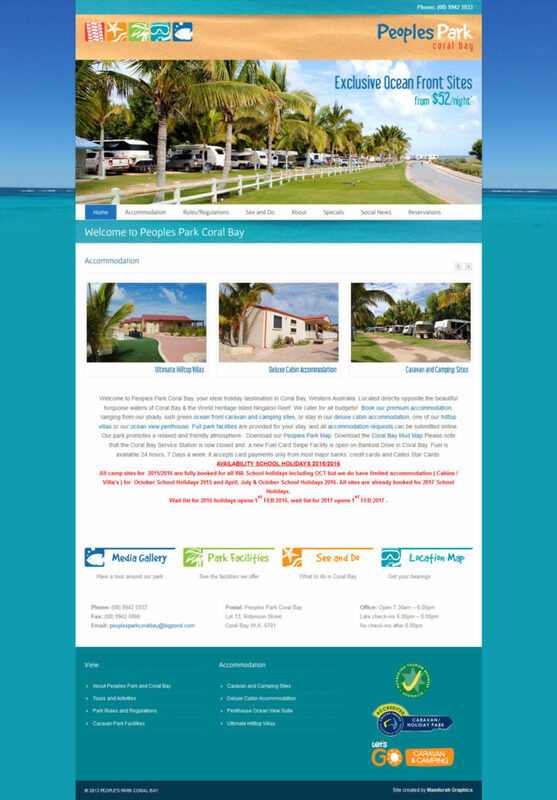 The Peoples Park Coral Bay website was created after the logo had been developed by Mandurah Graphics, making it a project we could really plan ahead for. The result was a bright, vibrant website, designed to catch the eye of potential holidaymakers looking for a place to stay on Western Australia’s coastline. The elements used in the logo have been utilised site-wide, their colours, shapes and patterns being constantly reinforced to promote a strong brand.